When the instrument blends transparently with musician's hands, performing becomes immersive. TruePianos virtual instrument was designed with exactly this in mind giving inspiration an instant GO as soon as you touch the keyboard. Following tradition, we optimized this instrument for real-time performance. The CPU usage does not cross the borders even for host applications runnign at 96khz, and for advanced polyphony we spread resource load across several CPU cores. TruePianos includes multiple modules and offers intuitive control to match your playing style. 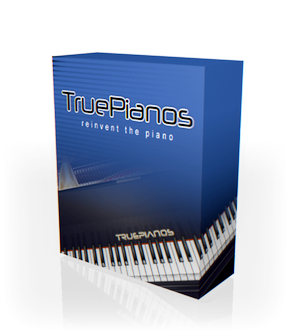 The full version of TruePianos currently contains five piano modules with a multitude of presets. It comes with one year of free upgrades and e-mail support. Within the support period our customers are also entitled for all additionally released TruePiano modules free of charge. True Piano, True Pianos and TruePiano are alternative spelling of our product, which are also valid. Fixes for minor issues that some customers have encountered. A 64 bit standalone version of TruePianos is now included to ensure compatibility with the upcoming release of MacOS Mojave. For the registered customers, the update is available immediately from the customer area of this site. Fixed crashes when bouncing audio with Atlantis module under some hosts. Performance improvements (slight reduction in CPU usage). Compatible with Windows 10 and Mac OS X 10.11 El Capitan. Please note, PPC is no longer supported for Mac OS X. Older version downloads are available for PPC users. TruePianos Lite for V-Machine 1.9.5 released ! TruePianos Lite is an optimized TruePianos version for the SM Pro Audio V-Machine. It contains single preset versions of the TruePianos Amber, Sapphire, Diamond and Emerald modules, each developed from scratch specifically with the V-Machine hardware in mind. For registered customers these great performing pianos for V-Machine are available immediately from the customer area of this site. Fixed a problem with non-retained registration info for Windows 7 users with multiple hard drives. TruePianos 1.9.3 for Windows and Mac OS X released ! Additionally, TruePianos demo versions have been updated to feature Atlantis module and the trial period has been reset for those users, who already tried TruePianos Diamond demo before. Visual glitches on Mac OS X fixed (with options screen, etc). For our registered customers, the update is available immediately from the customer area of this site. TruePianos 1.9.1 was released to correct the incompatibility with Sandy Bridge processor under Mac OS X. New TruePianos 1.9.0 for Windows and Mac OS X released ! TruePianos 1.5.0 for Windows, Mac OS X and Receptor released! 4Front TruePianos discount for Cakewalk SONAR customers. The Amber module of 4Front TruePianos is now included with SONAR 8 Producer Edition. TruePianos 1.4.0 for Windows and Mac OS X released! TruePianos 1.0.2 for Windows and Mac OS X released! 4Front TruePianos & discoDSP Discovery Pro cross discount. TruePianos customers are presented with a 30% discount when ordering discoDSP Discovery Pro synthesizer. Details are seen under a Special item in the Customer Area. Likewise, discoDSP customers are welcome to obtain TruePianos for a smaller price by using a coupon code, available through the member area of discodsp.com web site. TruePianos 1.0.1 for Windows and Mac OS X released! 4Front TruePianos & Rayzoon Jamstix cross discount. TruePianos customers are presented with a 26% discount when ordering premium Jamstix Jamboree VSTi drum modules. Details are seen under a Specials item in the Customer Area. Likewise, Jamstix Jamboree users are welcome to obtain TruePianos for a smaller price by requesting a coupon code here. Finally, TruePianos 1.0 for Windows hits the market. It is wonderful how the software has announced itself during the development period. By the time of release we have already sold few 'early bird' copies to our VIP customers, and we welcome you to join the team. Test version is available on the Download page. Copyright © 2005-2019, 4Front Technologies. All Rights Reserved. All registered company names, logos or trademarks are the property of their respective holders.